Transformers 5: The Last Knight is reportedly the last Transformers film by director Michael Bay, for the third time. Bay has made this promise in the past, and we all hoped it was true before. However, I hope it’s true for a different reason entirely this time around. It’s actually pretty enjoyable. Bay should end his run on the series on a high note, and this is likely the highest note the franchise may ever see under his watch. Let me preface everything I’m going to say with this: This is the same dumb movie you’ve already seen four times already, perfected. It’s better than all of the earlier films, in pretty much every way. In a way I’m doing a bit of a disservice by calling it dumb. Of all the Transformers movies, this is the most logically consistent, thoughtful, and endearing. Most importantly, for me, it’s the first film that isn’t offensively crude, sexist, or rife with stereotypes. I can’t fault the movie for any of the crimes of its predecessors, and I didn’t once utter a groan while watching this movie. I can genuinely say that I liked Transformers 5, and I am not embarrassed to say so. In my own headcanon, in a way this is the first Transformers movie, and the ones that came before don’t count. So, what’s to like? A lot, actually. The movie gets across a sense of history unlike no other Transformers movie before it. Like other Transformers movies, we get glimpses of the past via flashbacks, and unlike previous entries, this world feels alive. Characters both old and new populate this world, and exist for purposes other than cannon fodder. I really felt that there is a universe with a continuity out there to explore, and for the first time I want to see more. Beyond the world building, this is the first movie where I actually felt the Autobots are part of a family. In a way, that’s probably what I’ve been yearning for the most from all of the Transformers movies. The Autobots have a home, one that’s more than just a checkbox on a director’s task list, and it adds a lot to the sense of community. Cade Yeager returns, this time serving the role of Autobot house parent. He seems like the adult of the Autobot clan, and it’s a refreshing change of pace from the way humans have been presented in the past. He and the other humans in this world don’t exist just to setup the next joke. There are a lot of characters to like in this sequel. Probably the breakout character from the film is Cogman, who we have seen bits and pieces of from previous trailers and TV spots. I can see certain fans not liking Cogman as much as I, but they are probably terrible people. I anticipate that he’ll be the fan favorite coming out of the movie. He’s really a joy to behold. The role of Izabella, portrayed by teenage actress Isabela Moner, could easily have gone to an adult starlet and been played more like the heroines that Michael Bay is known for, but instead she is a plucky, resolute survivor, who is wise beyond her years, but still a child at heart. I didn’t know what to expect from Izabella going in, but I was surprised at how likable, and admirable she ended up being. It’s no secret that I am not a fan of most of the earlier movies. Most of them I consider to be genuinely bad. 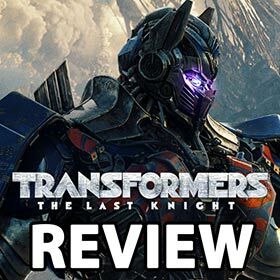 While I can’t say that this is a great movie, or even a good movie, it certainly is a great Transformers movie. It’s the best Transformers movie so far, and that includes the 1986 animated movie, which like most of you, I can quote line for line. If you’re not a fan of the earlier movies, give this one a shot, especially in a nice Dolby or IMAX theater. I don’t think you’ll regret it, not too much anyway. Please support Radio Free Cybertron by using our Amazon referral link.